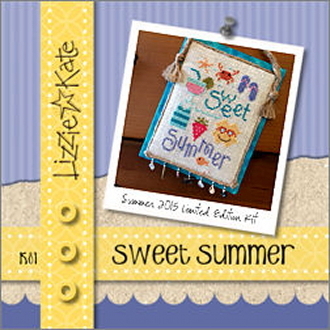 Lizzie Kate's Sweet Summer design is super quick, super bright and super fun...just like SUMMER! Sweet Summer Kit includes: 25 ct. Cream Dublin linen (easy to see for on-the-go stitching), watery turquoise beads, iridescent fiber (to stitch drink glass and sunglass lenses), the coolest trim with darling little seashells, and complete finishing instructions. Instructions given using Weeks Dye Works/Gentle Art Sampler threads with conversions for DMC embroidery threads (not included).